MANILA, Philippines - WAKE UP CALL. ABS-CBN News anchor Karen Davila in a Facebook post shared her traumatic experience with family in the surfing capital of Siargao. Karen with her husband DJ and their two sons David and Lucas flew to Siargao on March 28 to enjoy the vibe of the island. 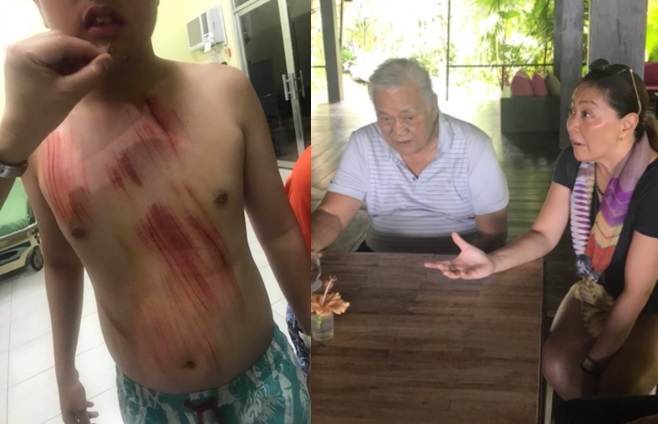 In the viral post on Friday, Davila was shocked on safety issues surfing in Siargao after her son David had an accident. The journalist said her son came bloodied, with his rash guard ripped apart just half an hour of surfing with trainor Jocol Valerio, who suddenly dissappeared after showing her husband the sari sari store where to buy the Betadine, cotton and gauze. "I have to say, I was in a moment of suspended disbelief. My husband immediately attended to my son, as they searched for a life guard, a medic or a small first aid station in Boardwalk Cloud 9 [ surfing site in General Luna, Siargao ]," Davila wrote. "My son’s whole chest, was bleeding from crisscrossing abrasions with a deeper gash under the right rib, clearly from hitting the rocks on the shallow waters, his chin bruised and covered with blood, his right hand in cuts like that from a small knife," the veteran journalist added. Beforehand, Davila specifically intructed Jocol, recruited by seasoned surfing instructor Junrey Taoy, to give special attention to David as he has challenges in coordination - being in the autism spectrum. Meanwhile, her younger son Lucas was assisted by Taoy. Resort owners Dingdong and Mildred Pabillore came with a van and offered to bring them to the nearest hospital. "At the municipal hospital in Dapa, there were no tetanus vaccines available. Mildred had to ask Junrey, Lucas’ trainer to take his motorcycle and buy Tetanus Toxoid & Tetanus Immunoglobin Vaccines, antibiotics and painkillers prescribed by the doctor. While there was a doctor and a nurse on duty, very helpful and attentive - there were no medicines. Foreigners were at the ER with us and I wondered, how do they attend to so many foreigners visiting the island with this set up?," Davila wrote. 1. Anybody who surfs in Siargao can train in Siargao. Some of the trainers are habal habal drivers, who train on the side for extra income. The instructors have no professional certifications. No requirement to be certified. No system of vetting trainers. Anybody with a surf board, who wants to earn P500 an hour can train. 2. There are NO LIFE GUARDS on the beach. NOT ONE. The rising mecca of surfing, with hundreds in the water - and NOT ONE life guard to save tourists from possible drowning or injury. 3. There is NO FIRST AID CLINIC or trained medical personnel at the beach. Sari-sari stores sell Betadine, alcohol, cotton, gauze, tape - proof that injuries are quite common, with supply meeting demand. Problem is, they are able to sell the first aid meds but essentially don’t know who to assist you. In other words, “bahala ka na sa buhay mo”. Davila was again shocked hearing the arguments from the mayor. She said, P1.2 billion was allocated for Siargao to improve infrastructure to boost tourism. She also recommended: "why not ask the resorts to chip in if you really don’t have the budget? With over 100 resorts in Siargao, imagine at P500 a month per resort, that’s P50,000 for a full time first aid clinic!" Davila also called the attention of Siargao Island Surfers Association, Siargao Tourism Operators Association and Department of Tourism to act on the issue. While her first visit to the island was traumatic but said she remain grateful. "My son is safe, others may not have been so lucky. Thank you to all the doctors, nurses and people who helped us along the way." The viral post has amassed over 10,000 shares and 14,000 reactions as of press time.